Programmer keys (Developer, Engine, OEM) can only be installed into interpreted databases. These keys are physically written in the 4D structure file and stay there until they are removed. Interpreted structure files can safely be compiled — installed plug-in keys will still be there in the resulting compiled structure file. End-User keys (Server Expansion, Runtime) should be installed into interpreted or compiled databases depending on their kind. 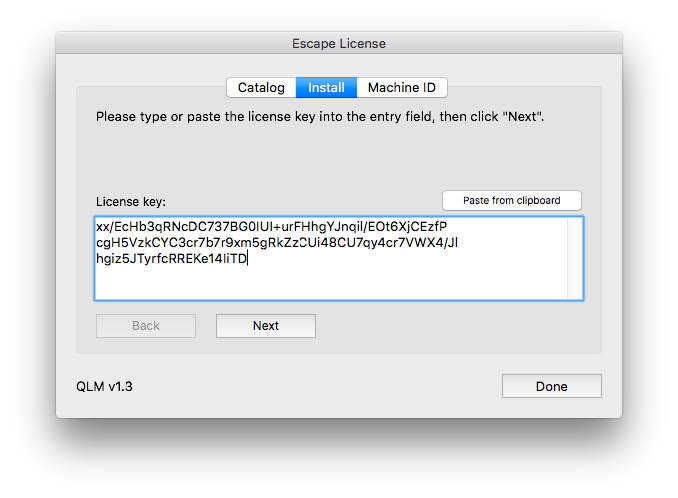 These keys are physically written in the Escape folder, inside the 4D folder of the machine on which they are installed. 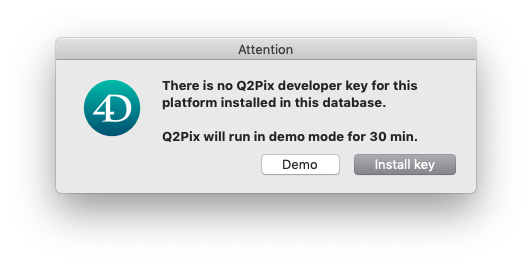 An error message saying that the kind of key is not applicable will be issued when attempting to install keys into a database that is not appropriate, e.g. programmer key into a compiled database. Online activation of keys takes place when a key is first installed on a new machine. 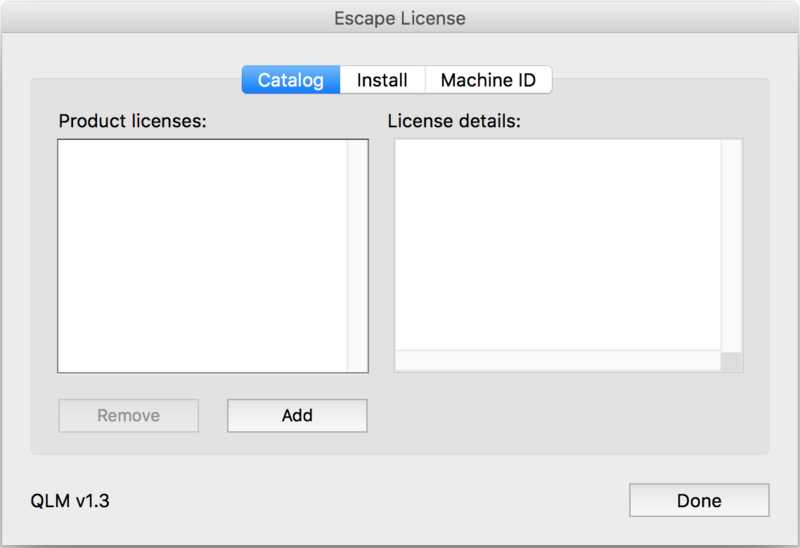 During activation, hardware identifiers of the machine are stored on Escape’s activation server. User privacy is never put at risk in any stage of the activation procedure. Demo mode is invoked when attempting to use the plug-in without a suitable license key. Demo mode will let the plug-in work for 30 minutes before restarting 4D. 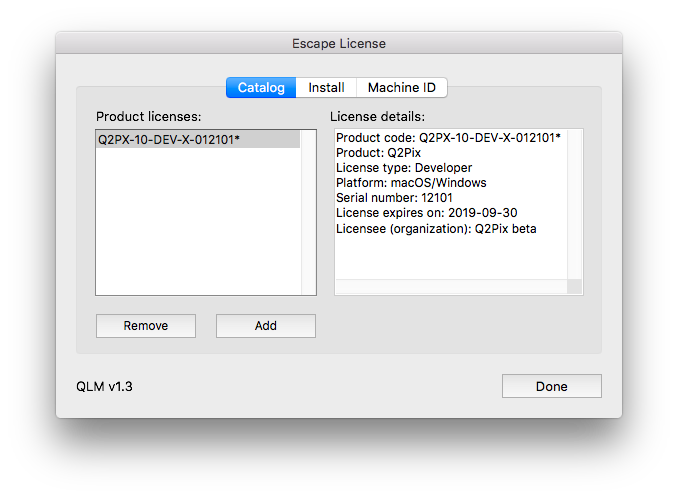 The ELM dialog lets review and modify all installed license keys of all Escape plug-ins, as well as obtain the computer’s Machine ID (needed when ordering pre-activated license keys). The ELM can be perused in both single-user and client/server. In single-user: keep down CapsLock and Shift when launching the database. 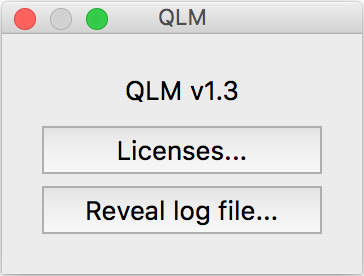 In client/server: click the “Licenses...” button on the QLM floating palette. The QLM palette opens when the server starts up but after 30 seconds of idle time it auto-closes to reduce screen clutter. To bring it up again, bring the 4D Server application to the front, press CapsLock and hold down the Shift key for 3 seconds. Start using the database and wait for the plug-in to ask for a suitable key. Click Demo if you don’t have a license key, to use the plug-in in Demo mode. If you have a license key, click Install key to launch the wizard and install it. Carefully copy all lines of the license key from your delivery email and paste it into the entry area. When done, click Next to decode and validate the key. The key has been decoded and validated, and its details are now displayed. Make sure you are installing the right one. If this is not the right key, click Back to correct the mistake. Click Next to activate and install the key (an internet connection is required for activation). The license key has been installed and you are seeing the Catalog tab of the dialog. To install another key, click Add. When done, click Done to close the dialog. The third tab of the ELM window shows the Machine ID of the computer. This is a hardware-based identifier for creating license keys that work only on this specific machine. Such keys are pre-activated, i.e. they do not require online activation, so they can be used on computers that are not allowed to access the internet. Take note of your machine’s Machine ID and send it to Escape when ordering pre-activated keys for this machine. 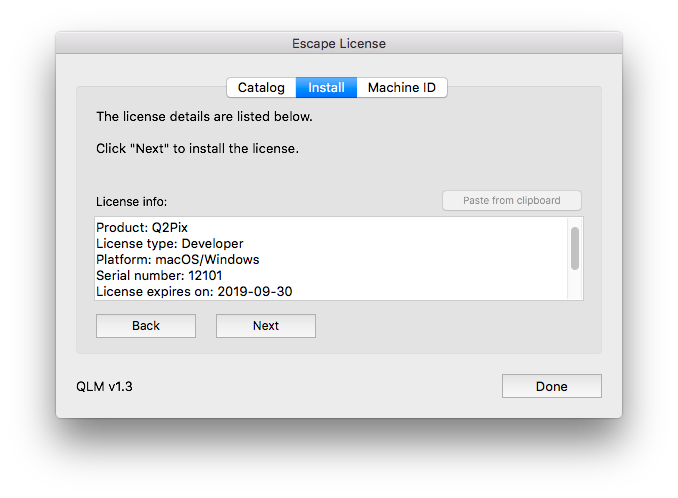 In client/server the administration of license keys is done exclusively from the ELM dialog, which can be invoked by clicking “Licenses...” on the QLM palette. If the QLM palette is not visible, press CapsLock and hold down Shift for 3 seconds. To start adding a key, click Add in the Catalog page of the ELM dialog. The opening of the QLM paletter on startup can be controlled via a configuration file, QLMConfig.json, saved in the Resources folder of the host database. The configuration JSON file may contain a single boolean property named OpenLauncher. Programmer keys (Developer, Engine, OEM) are stored in the structure file. The keys remain unaltered as the structure undergoes compilation, merging with 4D Volume, renaming, or even compacting. End-user keys (Runtime, Server Expansion) are stored in a .QLC file that resides in the Escape folder inside the 4D folder of the machine (in c/s this refers to the server machine). The name of the .QLC file is based on the name of the database (using only the letters, not the numbers or other characters). Where is licensing information stored?